Contractor GPs pay for expenses such as premises and practice staff wages out of their gross earnings - and these costs increased more than earnings, rising by 1.6 per cent to £164,900. 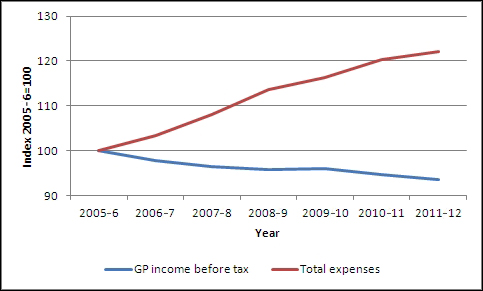 Almost 62% of Contractor GP earnings is taken by expenses of running the practice. But average statistics don't really tell the full story. Around half of contractor GPs (50.3 per cent) had an income before tax of less than £100,000, roughly the same proportion as in 2010/11 when 48.9 per cent fell into this bracket. Just 2 in 100 contractor GPs (2.0 per cent or 670) had an income of more than £200,000 before tax. Average incomes before tax were £106,100 in England, £93,300 in Wales, £92,800 in Northern Ireland and £88,700 in Scotland. Average income before tax for contractor GPs in 2004/05, when the current contracting arrangements were introduced, was £100,200 in cash terms and £119,300 in real terms. HSCIC Chair Kingsley Manning said: "This report provides a detailed insight into the income of GPs and their practice expenses, showing that the average income before tax of a contractor GP is £103,000. The data confirm a continued gradual decline in average GP incomes and will provide a useful contribution to discussions over the remuneration of the family doctors." “GPs are already demoralised by ever increasing and unmanageable workloads. This further pay cut for GPs while running costs increase, and the failure of the government to ensure that pay is frozen as it is with other NHS staff, will only add to this. 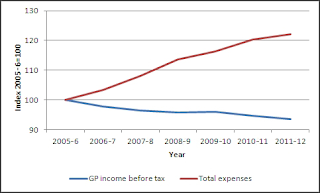 “Despite claims that pay is out of control there has been a 11 per cent drop in GP income since 2008, which along with increased bureaucracy has led to the current recruitment and retention crisis facing general practice. “GPs are working harder than ever before to maintain high quality services and carry out 340 million consultations a year. However, ever increasing costs of care without adequate funding to match is unsustainable and means quality of patient care will inevitably be hit.